a nice hotel in a nice city ... the only problem we had is to come from train station to hotel,,,, informations should be more efficient... about way , taxis or buses...in fact it s not difficult and not fare a way but.. .... will be better to know it before to arrive! 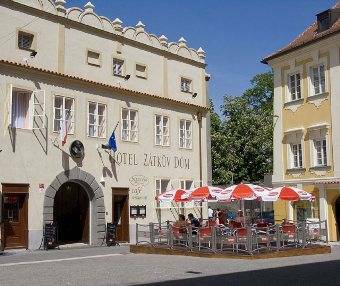 Hotel*** in the historical centre of the city Ceske Budejovice is located on the passanger zone, but you can enter to our hotel by car, we offer small parking lot inside the hotel complex (costs 150 CZK per night) . Our reception desk works round the clock, we speak English, German, Russian and French. We offer accommodation with buffet breakfast (included in price). In the hotel there is also restaurant opened 9. 00 am till 10. 00 p. m., hotel guests have 10% discount on meals there. It is Italian style restaurant but due to location in the centre of the city you can visit other restaurants of different style. You pay your stay at the arrival. Reservation not cancelled 24 hours before arrival we charge the price of one night. 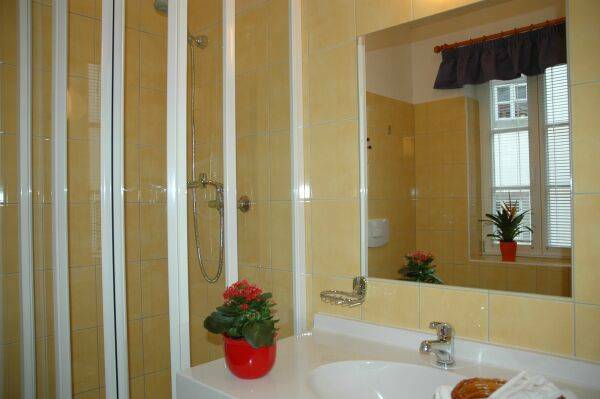 We are situated in the centre of the city in Krajinska street. By car: from Prague go along Prazska stree till Marianske namesti and there turn to Krajinska and we are on your right side. By bus or train: 1)get municipal transport nr. 2 and get out the 3-rd stop on Marianske namesti, turn to the right, cross the street and you are in Krajinska and hotel is on your right side. 2) go on food, it takes 20 min: go along Lannova street till the end, cross the main street and follow straight, go along the main square and at the end, turn to the right and our hotel is at the end of the stree on your left side. Municipal trensport nr. 2 costs 12 CZK, you buy ticket in the slot machine on the station and staple it in the bus.